The second stop on my trip to the north east was to Hartlepool, where I met Kevin in the café of a hotel at the marina. He played just under a season for the Hornets, during Graham Taylor’s last year, but there were still two key events I wanted to ask him about. He had played for Everton in the 1984 FA Cup final, so I could get the opposition’s perspective on the game, and he was sold with indecent haste by Dave Bassett after Taylor left in 1987. What do you remember about the FA Cup final, from Everton’s perspective? Howard [Kendall, the Everton manager] had got a good selection of players, a good balance. I stood in for Kevin Sheedy. I think perhaps if he’d played, Watford might have had a bit more joy, because he wasn’t as defensive a player. But I was told to stop David [Bardsley] getting forward and try to stop the supply to [Nigel] Callaghan. I was reminded by Colin [Harvey] and Howard to get back and stop Callaghan. If we can nullify him that would hurt them elsewhere. 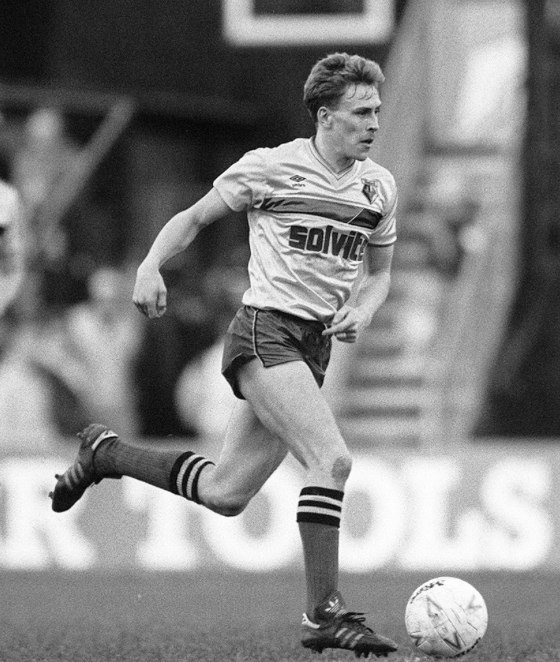 David was going to be more dangerous than the left back [Neil Price]. He could cross the ball from deep positions too or he could go on the overlap. I had a job to do out of possession. Keep it simple. I wasn’t going to run David and cross with my left foot, no chance, because I’m right footed. We were looking to try to get the ball forward down the right and then get in to the centre, pick things up and support but keep an eye on them breaking on us. It was a red hot day, it really was. We could let the ball do the work whereas there was a lot of running and closing down involved in that Watford game. We thought if we can force them to close us down, well, you can’t keep that up for 90 minutes in that heat. They would come in waves of attack and we knew that if we could soak that up and survive we could get into the game. They were a fit side though? They were. They didn’t get tired easily and when I joined them later I found out later just how fit they were. But we [Everton] were fit too. Barnes was up against Gary Stevens – Stevens was one of the fittest players I ever knew. He was quick and strong, so in a way we were set up to cope with what we knew Watford could throw at us. We had the players to nullify their threats. Then there was the aerial threat of the big man, Reilly. He was a big man but Derek [Mountfield] did really well. Reilly’s not going to turn and run you, so back off if you need to. Stop the crosses. If it does come in, then you have to get to the ball first. We knew about their effort, their commitment. We knew they wouldn’t play into midfield unless it was necessary and we knew exactly what they were good at. It was a hard game but it wasn’t as tough of some of the games against Watford. Did you feel that having played in the Milk Cup final at Wembley earlier in the season you had a bit of an advantage? We lost that final in a replay and I definitely think we went to Wembley for the FA Cup final to win. Definitely. Because of what happened against Liverpool. It was a chance to try to give our fans a cup to celebrate. We were determined to go out there and win. We knew we’d have to work hard because that’s the way Watford were. We’d have to put up with their game and then when we got a chance to play we’d put our impression in the game. I think we were just at the beginning of something. Liverpool beat us in the Milk Cup but it was close and we pushed them hard. It was only another couple of months on but we were improving so rapidly. It was a great side. [Kevin] Ratcliffe, [Adrian] Heath, Peter Reid, Andy Gray, we had a spine of players who were real strong characters. Peter Reid was so focused on the game. He was so fired up and he was the engine room. The team spirit at Everton, I’ve never known anything like it in all the teams I’ve ever played in. Everyone was at it. If someone wasn’t doing the job they’d get it. We bucked each other up. If Reidy wasn’t at it, I could buck him up. Do you feel you coped with the occasion a bit better than Watford? Probably collectively we did. We’d been there before. It’s an amazing match to play in and if you’re not careful the emotion of it all can be overwhelming. It’s all cool and dark in that tunnel. Then you come out into the bright sunshine. It feels like everyone is watching you – because they are – but you’re suddenly so aware of it. I don’t think many of the Watford lads had that much experience. What was going through their minds when we went out? ‘Bloody hell, what’s this?’ I could look round and there was Andy [Gray] and Kevin [Ratcliffe] and [Graeme] Sharp. The occasion, the weather, the commitment they were putting in, eventually it wore them down. What did you think about the second goal? It was a foul by Andy Gray, wasn’t it? It wasn’t given was it. In the second half, we did expect them to come back at us but we got the second goal and that was it. Maybe Watford feel that was harsh but the cross came in and Andy went up with the goalie. That’s Andy’s game and he’s very good at it. He goes for the ball. The striker’s mentality is to go for the ball. The goalkeeper is to come and collect or else. The goalkeeper has the advantage doesn’t he so if it’s a foul he has to make sure it looks like a foul. I don’t know, I think it’s 50:50. But I would say that because it went our way! What was it like winning the cup? And did you feel anything for Watford having been in their position earlier in the season? On the final whistle we had total respect for Watford’s players because they had given everything. It’s all about the fans that moment really. You go to the horseshoe at the end of the ground and you see the fans and you realise it is for them really. Full credit to the Watford supporters, they all stayed and they must’ve been so disappointed but they clapped us too. When we got back to the dressing room there were beers and a few bottles of Champagne. We soaked Howard with Champagne. Celebrated in the bath, six foot deep, full of water, messing about. It was about half an hour after that, standing in the bath, arms on the side and feet off the bottom that it started to sink in. I’ve been to Wembley, won a cup, got the medal. It started to sink in that we’d achieved something that every player would have wanted to do. We’d experienced losing to Liverpool in the Milk Cup and you just feel so drained and empty. Your mind is blank. It’s like you’re numb for a while. Your brain is numb. I just remember looking round and everyone was just staring at their feet. Just going back to the build-up, you had Freddie Starr, the comedian, at your hotel before the match. Watford had Michael Barrymore. Do you remember that? How can you not remember Freddie Starr? It was funny. He was dressed up in his German soldier’s outfit and wellies. There was this noise on the green outside the hotel. We were looking out the window. He’s walking along and he falls in a hole. It was funny. We’re all being filmed by the TV looking out of the window. 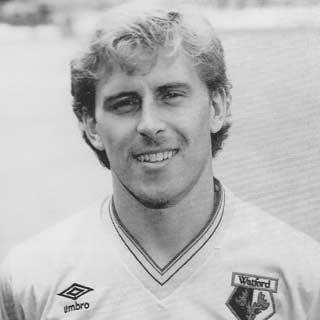 So fast-forward a couple of years, to September 1986, and you join Watford. How did it happen? Graham told me he’d always liked what I did. I remember playing a youth cup game against Watford [for Everton] and it was Callaghan on the wing for them. He had quality. He could put a ball on a six-pence. He was a great crosser of the ball. I recognised I had to stop him. I had to put a few tackles in on him and I think GT was there. When I was available he remembered he’d seen what I’d done in the youth game. He wanted a central midfielder like that to compliment the wingers and the strikers. He was in the process of changing the team a bit and I was a bit of his jigsaw. Everton had won the league title, reached FA Cup finals. Were you disappointed to leave them and go to Watford? Watford was a smaller club compared to Everton and perhaps they weren’t going to have a realistic chance to win the league but they could win a cup and I felt if I went there we could win a cup, or maybe finish top six. It was a smaller club but I didn’t feel like I was dropping right down. I had signed a two-year deal at Everton but I wasn’t in the team at the start of the season. I had given it a good go but I wasn’t in the side so I went to see Howard one day and said, ‘I’ve tried my best but I’ve got a few players ahead of me so I think it’s best to move on.’ I said, ‘Thank you for everything but I’d like to get a move.’ He tried to talk me into staying but I couldn’t train all week and sit on my backside on a Saturday. I wanted to play. Did the style of play, or the perceived style of play, concern you? No because I’d played against Watford and knew there was more to it than people thought. Okay, so they didn’t pass, pass, pass it in midfield but they needed good quality midfielders. You can’t tell me Kenny Jackett wasn’t a classy player. I think Graham was looking to pen teams in, win the second ball, get it wide to the wingers. Be direct, fine, but pen them in and keep possession. Rather than knock it over the top for strikers to chase? Luther was great at that but when Mark [Falco] came in we weren’t going to hit it over the top for him. Mark wouldn’t get on a through ball, would he! Sorry Mark. I do remember asking Graham what he wanted me to do and he said my job was to win the ball and keep it a little while to make sure we stayed up there and kept the opposition back. They had had success the way they played but they maybe needed to tweak things and I was maybe a little tweak. Was Graham different to Howard Kendall? They were quite similar in a lot of ways. Both very focused. Graham covered every little detail of how we’d play, how they might react. Howard maybe wasn’t quite so detailed because he knew he had 11 international players who could sense where to do it and where to drop back. But Graham would cover everything. Sometimes his little chats would go on for about an hour. I used to think, ‘Flippin’ heck we’re getting a lot of information here.’ Sitting on those wooden benches your bum started to go numb. I remember once I stood up because my bum was numb and he said, ‘What are you standing up for?’ I didn’t do that again. He wanted the best out of his players. His level of detail made it easier for the lads on the pitch. Your debut was against Wimbledon, who had just come up. They won 1-0. What was that like? Flippin’ heck, it was like watching a tennis match. I thought I was the net! They took the old Watford way to extremes. The first few games I was a bit concerned because I wasn’t getting a chance to get on the ball. The football bit was in the final third. It took some getting used to. Don’t look to get the ball off the defence, look to get it off the strikers and then push forward. Play up in their third of the pitch. A couple of weeks after I joined we worked very hard against Man United to beat them 1-0. We were really good that night but I thought, ‘Well, we’re not going to football teams to death but we are very effective and we have got quite a bit of quality in some areas. We could do something here.’ It was a different style of play for me but I got used to it quite quickly. It would have been interesting if Graham had stayed another year because I felt the team was being built up. He started shopping in Primark and he wanted to get to Marks and Spencers and he was maybe in Tesco when I arrived. It would have been interesting if he’d stayed another year but Villa recognised his qualities. There were a few options in the team at the time, we didn’t just play one way. The front four could create problems but we didn’t just hit them, we could squeeze teams in. There was togetherness and endeavour and honesty about the team and I really enjoyed it. It’s only lately I’ve realised how many players from the north-east Graham signed for Watford over the years. I’ve spoken to Colin West and I’m seeing Wilf Rostron later today. Jill and Wilf Rostron helped us to settle in. We went on holidays together. We’ve been friends a long while. He’s a smashing lad. Maybe Graham liked no-nonsense people. I think he probably did. I tell you what, though, it was a bit of a shock to the system the house prices down south. The prices were sky high and it was a squeeze with the wages, I can tell you. You did stay in the FA Cup long enough to avoid a few Tuesday runs, but the semi-final against Tottenham was one to forget wasn’t it. Yes. The goalkeeper [Gary Plumley] who played didn’t help us much. The opponents must have thought, ‘Let’s just get it forward, let’s get it in the box, let’s get it in the box and make it uncomfortable.’ He’d done the best he could. But it was a massive boost for them to know they were facing a goalkeeper who was not First Division standard. They knew they were going to have shots and corners. If you can play and get forwards you can keep them away from your goal but they are going to have chances. They were going to have their periods of the game where we’d have to defend as best as we can. Unfortunately once one went in, that was it. It’s impossible to say how much of an effect it had on us. It’s easy to blame him but he was asked to go in goal and he did the best he could. He could have said, ‘No,’ to protect himself. But he was asked and he stood up and said, ‘Yes, I’ll do my best.’ If he’d pulled off a couple of saves and we won 1-0, he’d have got all the credit. But it didn’t work out like that. To get that far and then lose in the semi-final like that was very disappointing. Did you have a feeling Graham was going to leave? There was rumours just before the end of the season but no one really took much notice. Graham was focused just like he’d always been as far as I could tell. So did it come out of the blue? It did for me. I tell you what, though, when he went, the heart went out of Watford. Maybe he felt he’d took it as far as he could. Maybe he wanted to change, maybe he wanted to test his abilities at a bigger club. What did you think when Dave Bassett, ex-Wimbledon manager, came in? My first thought was, ‘Hello, this may not suit me.’ Dave had done very well at Wimbledon. But we’d been moving on from that [style] a bit more. We’d been expressing ourselves and we weren’t just a long ball team, far from it. He’d have his small-sided games in training. We used to drill diagonal balls from full back to a wide player. I was just stood there in the middle. May as well not have been playing. When I did get it, I had to knock it back up there. That was it. Sometimes the gap from the back four to the midfield was massive. The goalie was dribbling it out and kicking it, which was something that wasn’t done then. Did you fall out with Bassett? No, I wouldn’t say that. I wasn’t Dave’s type of player. As a bloke, he was like one of the lads. He was fine. I didn’t fit into his football. If he was going to play like that he wasn’t going to get the best out of me like that. At the end of the day I’ve got to go on the pitch and people are going to be there watching you so you can’t play a game that is totally alien to what you are used to. I think we both knew I was going to go. Dave was not playing me in the early games – he made his mind up about me and I went to Arsenal. A year and a half later you won the league championship with them. Yeah, and Watford got relegated. Not that I took any satisfaction from that at all, mind. To be honest, he [Bassett] didn’t just move me on, he moved a few on so it wasn’t about me. I was told a story about one of the coaches teaching you how to kick the ball after you fired a shot over the bar in training. What are your fondest memories of being at Watford? It was a good year. I met some lovely people and we did well. Where did we finish? That’s not bad, is it. They’d take ninth in the Premier League now. I thought we had some great players – John Barnes, McClelland, Tony in goal. Falco scored a few goals. Wilf was a lovely fella and a great captain. Kenny, Luther. You can go through that whole side and say they must be some of the best players to ever play for Watford. So it was nice. I just couldn’t stay to watch it get booted over my head for 90 minutes.